At the turn of the past century, the main function of a newspaper was to offer “menus” by which readers could make sense of modern life and imagine how to order their daily lives. Among those menus in the mid-1910s were several that mediated the interests of movie manufacturers, distributors, exhibitors, and the rapidly expanding audience of fans. 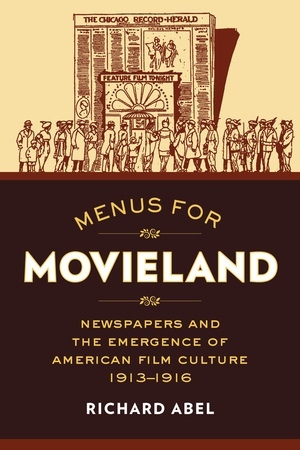 This writing about the movies arguably played a crucial role in the emergence of American popular film culture, negotiating among national, regional, and local interests to shape fans’ ephemeral experience of moviegoing, their repeated encounters with the fantasy worlds of “movieland,” and their attractions to certain stories and stars. Moreover, many of these weekend pages, daily columns, and film reviews were written and consumed by women, including one teenage girl who compiled a rare surviving set of scrapbooks. Based on extensive original research, Menus for Movieland substantially revises what moviegoing meant in the transition to what we now think of as Hollywood. Richard Abel is Emeritus Professor of International Cinema and Media Studies at the University of Michigan. He is the author of The Red Rooster Scare: Making Cinema American, 1900–1910, Encyclopedia of Early Cinema, Americanizing the Movies and “Movie-Mad” Audiences, 1910–1914, and Early Cinema, among other books.